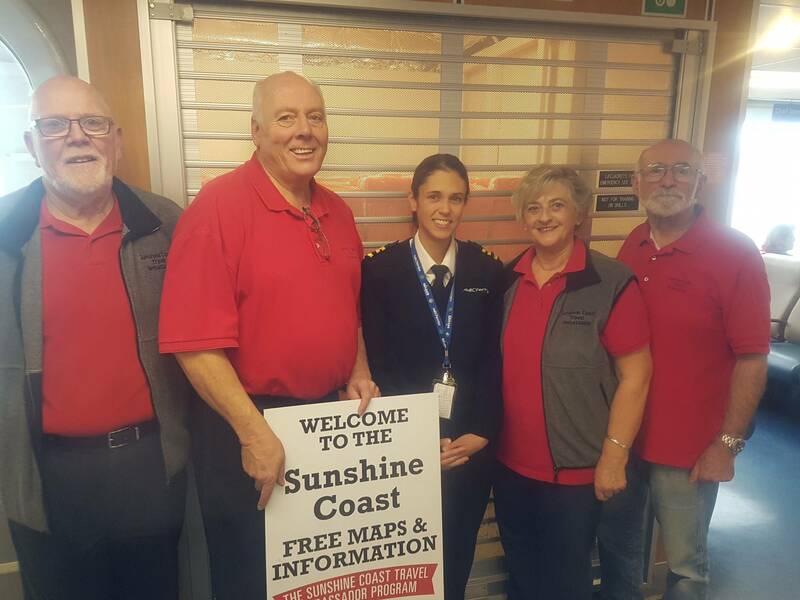 The Sunshine Coast Travel Ambassadors (T/A’s) are a group of volunteers who assist both visitors and locals with travel information on B.C. Ferries Route #3 Langdale-Horseshoe Bay. The T/A’s wear distinctive red shirts and each year welcome approximately 20,000 visitors. The program operates from the Easter long weekend to Canadian Thanksgiving. The program began in 1997 and operates under the direction of the Gibsons & District Chamber of Commerce. The program is supported by local businesses and government (the Town of Gibsons and the Sunshine Coast Regional District). T/A’s receive regular “familiarization” information to give them first-hand knowledge of the many activities available to visitors to Gibsons and the Sunshine Coast. T/A’s provide the latest in Directions, Places of Interest, Sights to See, Activities, Special Events, Arts & Culture, Parks, Trails, Beaches and more. As many of these volunteers have been residents for many years, they have the “inside track” on places to go and places to see. The T/A’s are the first contact for visitors to the Sunshine Coast and we thank B.C. Ferries and crews for their ongoing help in maintaining this valued service. The T/A’s enhance services provided by the Visitor Information Park Wayfinding Maps with summer Kiosk for personal service as well as providing direction to the full service Visitor Services Centres in Gibsons, Sechelt and Pender Harbour. The T/A’s are a positive asset to the Visitor’s experience to the Sunshine Coast. To find out more about the Travel Ambassadors Program, email the Gibsons & District Chamber of Commerce at exec@gibsonschamber.com.